For the grown-up who heads back home for the holidays and other occasions, here is a "Survival Kit" to keep them laughing (and coping!) for the entire visit! 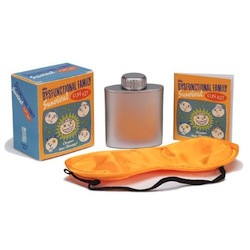 The "Coping components" include a hip flask, a deluxe eyemask (which gives the impression one is actually listening), one set of "Just Deal" Conversation cards, and a 32-page book chockfull of fun games and activities.